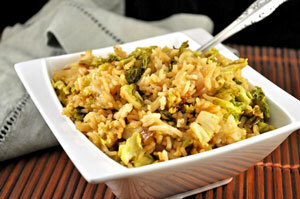 Fried Rice with Shredded Savoy Cabbage, Thyme for Cooking easy side dish. Cook rice in stock until done. Remove from heat and uncover. Heat oil in a large nonstick skillet. Add shallots and sauté until just starting to brown. Add cabbage and sauté until crisp-tender, 5 - 8 minutes longer. Add rice, soy sauce and vinegar. Stir well to combine. Stir-fry for 3 - 5 minutes longer. Serve.